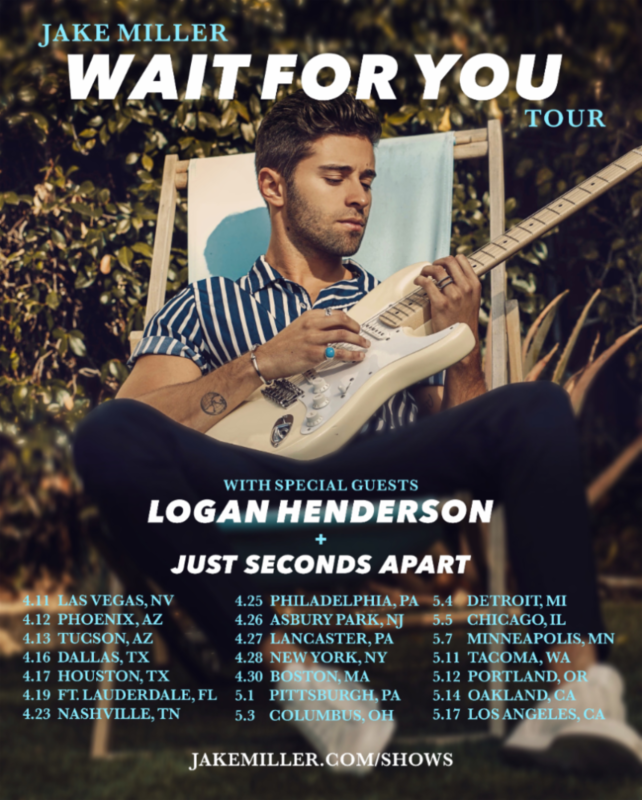 Singer, songwriter, and producer Jake Miller announces today his upcoming spring 21-date headlining ‘Wait For You’ Tour starting April 11 in Las Vegas and ending May 17 in Los Angeles. The tour will hit major U.S. cities nationwide including New York, Chicago, Houston, Nashville, and more. During these shows, Miller will perform new music off his forthcoming EP, due this spring via RED MUSIC, including his new single “Wait For You,” which is currently featured on Apple Music’s A-List Pop playlist and has clocked nearly 3 million streams to date. The tour will include opening performances from two special guests including multi-platinum recording artist and fellow label mate Logan Henderson and Arizona-based pop-rock band Just Seconds Apart. Tickets will go on sale to the public on Friday, February 1 at 10:00 am local time HERE. Jake Miller’s latest single “Wait For You” officially impacts radio today and is already receiving national radio airplay support from influential pop stations across the country including SiriusXM Hits 1, Radio Disney, KISS Pittsburgh, KISS Cincinnati, WZPL Indianapolis, Hot 107.9 Syracuse, WKRZWilkesBarre, and WBHT Wilkes Barre, among others. Yesterday, Live Nation’s Ones to Watch premiered the live “Wait For You” acoustic music video and hailed Miller’s musicianship, “this stripped-down performance showcases Miller’s ability to switch sonic gears from booming, enthusiastic pop to a soft, piano-driven ballad style.” CLICK HERE to watch the video directed by Austin McCracken and filmed at TheBarber Shop Studios. “Wait For You” combines Miller’s signature blend of pop with heavier electronic influences and is a testament to his fearless approach to production and songwriting, as well as his ability to push his own boundaries in the studio. Recorded and self-produced in Los Angeles, Miller’s lyrics tackle the complexity of relationships. “Wait For You” debuted at #1 on Apple Music’s Breaking Pop playlist, charted on Spotify’s Global New Music Friday in 8 territories, and has clocked nearly 3million streams to date worldwide. The single is currently featured on Apple Music’s A-List Pop playlist. Jake Miller’s rise to pop superstardom shows no signs of stopping in 2019 with a new State Management modeling contract and a forthcoming EP this spring via RED MUSIC.